I’ve been writing about Bradford City for over 11 years. In that time, I have produced countless articles about players, managers, chairmen, matches, the stadium, finances, football kits, the training ground, and about the general supporting of a football club. There is one major topic, however, that I could count on one hand the number of times I have written about. The Valley Parade Fire Disaster of 1985 was before my time. I was only three-years-old when it happened, and I was living in Wales. I have never felt it is my place to comment on such terrible events, even though like most City fans I feel and appreciate the pain and heartache it has left on the Bradford City community that I am a part of. I have watched TV programmes and read books about the tragedy, and each year I bow my head, alongside thousands of other City supporters, as part of a minute’s silence at the final home game of the season. As editor of a high profile Bradford City website, I’m conscious that Width of a Post has a part to play in making sure these events are never forgotten. And for the most part, the way in which we supporters remember 11 May 1985 is still very insular. When three years ago I co-wrote a series of articles about spending time with the late Archie Christie, one of a number of criticisms we received was the fact the then-Head of Football Operations had spoken about the Fire Disaster during his interview. The inference was that Archie – very much viewed as an outsider – should not have a view on this subject. It is an understandable viewpoint, because to those who were there that May 1985 day, or who lost someone there that day, or who had their life affected by what happened that day, the rawness of the pain they feel should never be underestimated or forgotten. Their feelings must always come first. But yet things are changing, and over the last few years there has been an agenda from many City supporters to be more extroverted in how the Fire is remembered. It began with chants about “the 56” at games, and grew into a giant flag at Wembley stadium for the League Cup Final. And a sense of indignation has been increasingly heard from these people – indignation that the rest of football doesn’t remember Valley Parade like they do the Hillsborough disaster. That they don’t bow their heads alongside us. The 2014 anniversary coincided with the final day of the Premier League season, and there was outrage from some that a minute’s silence was not held in the top flight stadiums. This is despite the fact other clubs have never have done so before, nor has it ever been asked of them. Next year – the 30th anniversary of the tragedy – will be different. The FA has already announced that every ground in the country will hold a minute’s silence to mark the terrible events. And in doing so, the conversation will become a national one. There are many people within Bradford who are delighted by this, but others have reservations. Because taking the conversation nationally is to lose control of its direction. Which brings us onto an article that appeared in the Guardian this weekend, by lead football journalist Daniel Taylor. In what looked set to be a heartfelt piece, Daniel shared the story of his school friend, Martin Fletcher, who was a City fan and present in the Valley Parade main stand on the fateful day. Martin was dragged out of the stand as the flames spread, but his brother, father, grandfather and uncle were not so lucky. He was traumatised for years after (Daniel wrote: “On a geography field trip six years later we were woken most nights by the screams of his nightmares”). In his Nottingham school Martin was cruelly taunted by classmates over the damage the fire had done to his face. And incredibly, in 1989 he was at Hillsborough to see his adopted team, Nottingham Forest, in their FA Cup semi final with Liverpool; which provided him a close-up view of yet another tragedy. It is a horrible story to read, but brave of Martin to share it. 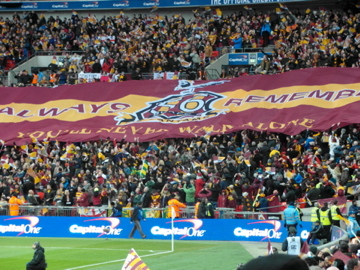 Unfortunately, other elements of Daniel Taylor’s article have overshadowed the survivor’s tale, as the journalist adopted a critical stance on Bradford City’s then-owners, the way in which the club initially failed to adequately mark the tragedy, and the introverted manner it was remembered by the Bradford City community. Perhaps most damaging of all is an allegation that then-Chairman Stafford Heginbotham, and later Jack Tordoff, made a six-figure profit from the disaster, due to a surplus of public money that they received to rebuild Valley Parade. This article has caused a stir to say the least, with a number of angry City fans claiming there are inaccuracies over how the club remembers the 56 fans who lost their lives. That there has always been a memorial at Valley Parade. That black has always being worn within the kit and that a minute’s silence is held every year. Via Twitter, Daniel Taylor has robustly defended the facts he presented, and Martin himself has left a comment in the Guardian’s reader comment section to state that what his journalist friend has written was entirely true and accurate. The story has continued on Tuesday with the intervention of a Telegraph & Argus article – very well written by Simon Parker – defending the way the Bradford community reacted to the terrible events. This was followed by a rather public – and very ugly – Twitter spat between the T&A sports editor Blake Richardson and Daniel Taylor. To be critical of Daniel Taylor, the way he presented a couple of the facts was slightly misleading. He wrote that until 2001 there was no memorial at the ground, when in fact, as Martin stated, there was a memorial at the ground, but it was one that was not paid for by the club. Martin wrote, “The memorial sculpture at the ground was donated by Sylvia Graucob a Jersey based benefactor originally from Yorkshire – The club made no contribution to it at that time despite its £200,000 surplus – Often away fans who bought flowers/wreaths (as was reported at the time & I’ve been told since) would be surprised there was nowhere to put them other than on the Valley Parade pavement.” In 2001, Geoffrey Richmond and the council jointly funded the much-improved memorial that remains outside the Main Stand today. Taylor also wrote that “The club, for many years, did not even send anyone to the annual memorial service in Bradford’s Centenary Square,” but it was later clarified that it was only up until 1992 that this was the case – which means that for 23 of the 29 annual memorial services which have been held since the disaster, the club has sent official representation. There was, it seems, a reluctance on the club’s behalf to do much in the initial years after the disaster, and this has been more than rectified since. But the point is still valid. When I first started watching City in the late 1990s, there wasn’t a minute’s silence at final home game of the season – I remember some controversy about it at the time. The first time it occurred, when I was there, was in May 2000 when Liverpool came to town on the day of Premier League survival. Similarly, the original memorial was not one that was immediately obvious as being something to mark the 11 May 1985 – it didn’t, for example, list the names of the 56 supporters who lost their lives. The point is that the Bradford City community did not used to recognise the Valley Parade Fire to the level it does now. I don’t personally think it’s entirely fair to look back retrospectively and criticise this, nor is it black and white to question why no one was made accountable for the tragedy. Britain has changed, and culturally things are very different. If the Fire had taken place in 2014, the recriminations would be greater than they were back then – we live in a society where people are brought to book. Similarly, in this social media-driven world, public outpourings of grief are not only expected but encouraged. Witness the recent coverage of Australian cricketer Philip Hughes. It is difficult and perhaps unfair to judge the past through the lens of today. To apply standards and decorum of 2014 to 1985. But equally, if we are asking the football world to bow their heads with us on the thirtieth anniversary next May, we want it to be meaningful rather than a tick box exercise. You want people to know and understand what happened, and to appreciate that safer football stadiums, up and down the country, are the result of lessons learned from such horrific events at Valley Parade and Hillsborough. But doing so opens up the likelihood that people will look at these events and form their own judgements – judgements that may be ignorant, incorrect or misleading (not that Daniel Taylor is guilty of this). Just look at the horrible lies that the families of the Hillsborough victims have fought so hard to undo. Bradford closed ranks in 1985, and for a long time has kept the way it remembered the Fire a low key, very personal affair. Culturally, this has changed now and there is no doubt that the thirtieth anniversary is going to be a major media affair. (Surely the memorial service will be moved from Centenary Square to Valley Parade, in view of the likely huge turnout?) I don’t know if this is entirely a good thing, but I do know that the priority should remain unchanged to the one in the early years after the Fire: the people of Bradford, and specifically the people who were affected by what happened that day, are the people who matter first and foremost. That includes Martin. His perspective might be very different to others involved in that tragic day, given he moved away from the area, but he deserves to have his say and he should be welcomed for saying it. It might not be what everyone wants to hear, it might not be a representation of the wider feelings from the survivors, but it is straight for the heart. And as it forms the heart of Daniel’s piece, we should respect that. Respect that, whilst noting that the upset of others in response highlights that there are a wide range of viewpoints that must equally be respected. There was an initial perception that Daniel Taylor had produced a lazy article without checking the facts – but his robust defence demonstrates that this is anything but. He has done his homework, and has provided evidence to support his claims. Instead, it comes down to an interpretation of those facts. It is clearly not an interpretation that is to everyone’s taste, and has understandably upset a lot of people. Ultimately, it is unfortunate that what is so negatively judged is the reaction to 1985 during the immediate years after, when the pain was at its rawest. Perhaps the club were wrong to not hold a minute’s silence for the first few years, and to “clamp the jaw shut” in an attempt to forget it, but none of us who weren’t part of those events can possibly understand just how those who were must have felt in the aftermath of such a dreadful disaster, and we simply don’t know how we ourselves would have reacted. How can we therefore judge their actions? In 1985, it appears that the focus was about remembering the survivors, and what was best for helping them recover from such a horrific experience. I have heard stories from survivors, and of survivors, and these stories are of people who had nervous breakdowns or who could never work again or who felt guilty that they survived whilst others were less fortunate. I cannot image how much support these people needed (and in some cases even now still need) and I just hope they all got it. The most important thing is that the Fire – and the 56 people who lost their lives – is now very well remembered, and will certainly never be forgotten. 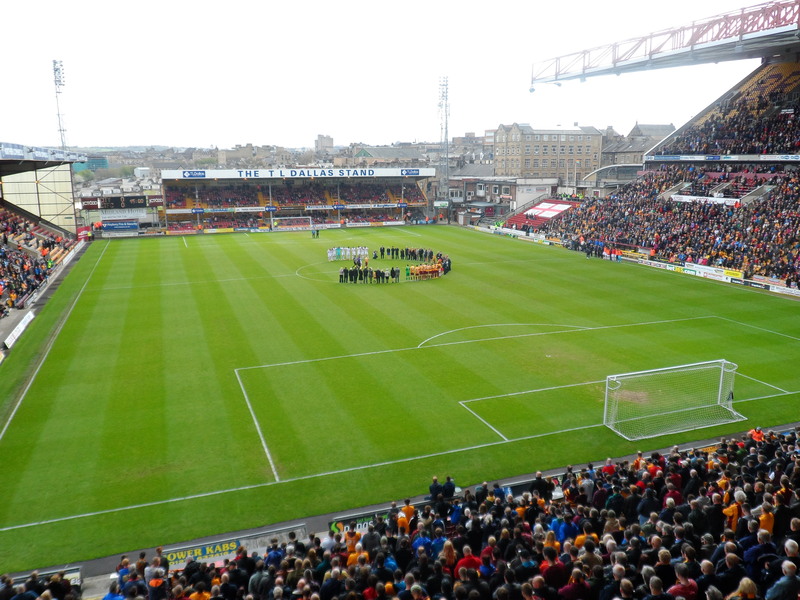 It is a deep part of the fabric of supporting Bradford City, and has left a heavy imprint on the community around it. Perhaps we all now need to take a step back and reflect on this, before something that should bring everybody together threatens to drive us apart. Great response Jason although I wouldn’t expect anything less. This ‘public’ grieving seems to have gained momentum since Princess Diana’s death in ’97. The years immediately after the fire were met with a kind of Bradfordian stoicism. It was never ignored and certainly never forgotten. Times have changed and with it the attitude of people towards commemorating such tragic events. I feel that Daniel Taylor could have borne this in mind and been more sensitive in his approach. Graham makes a really good point here. It’s easy to forget that the holding of a minute’s silence at a football match for most things is a fairly modern phenomenon (and some would say that we have reached the stage now where it has been devalued by overuse). It’s unfair to judge the behaviour of the late 1980s and early 1990s against the culture we have now. It took Rangers 24 years to have a large memorial at Ibrox to the 1971 disaster but that doesn’t mean they care any the less. agree completely. I think the way Bradford dealt with the tragedy has been perfect with a minutes respect from all being the prefect finale to the process, with closure. Let’s not be swayed by a few journalists with columns to write. Good article. The problem is there never was a guide book to help anyone connected to the Fire; supporters, the Club, the players, the media. It was a terrible event and no-one should be criticised for how they dealt with it. As you say, the important thing is that the 56 are always remembered and I feel sure they always will be. A really thought provoking article. As one who was sat 10 feet away from the start of the fire that day I was one of the lucky ones. However for years after I would wake up in the night in a cold sweat. Being in the Air Force at that time, during annual ground defence training the film of that day was often used in the fire training section. I used to get up and walk out and am still not able to watch in its entirety as I can make out myself on it. It was not until the 20th anniversary that I felt able to attend the memorial service. Before that I would take myself away somewhere quiet to remember & give thanks that I was able to return to my family. Of course 56 were not so lucky and with the 30th anniversary coming up it is paramount that the wishes of their families dictate the way we remember. I would hope that the ceremony is not moved to Valley Parade. There was a very large crowd for the 25th occasion and Centenary Square coped however I would like to see the Archbishop of York invited as he gave a wonderful uplifting speech that day. I have always been proud of the quiet and dignified way we have remembered over the years. I am not a fan of the 56th minute applause or flags. I have bought the t shirts and buy a new ribbon every year as this supports the Burns Unit. Liverpool fans rightly have made a bigger “noise” over their remembrance but they were fighting for closure and the truth of what happened that day. In our case we knew exactly what caused our loss. Whatever is decided, if god is willing I will be there to remember as I know many others will. If you see a balding ginger with tears streaming down his face it will probably be me. And so it begins…one of the reasons why we have been content to grieve alone for the last 30 years is to avoid this publicity and the biased reporting tone present in this article. There will be more like this – because there is no news in an accident and in today’s world there must always be someone to blame. A certain section of fans who have demanded ‘respect’ measured in Facebook ‘likes’ – these efforts mean the rest of us will spend the year seeing pictures of the stand aflame (really guardian ? People are dieing in that photograph) and reading about how our method of grieving isn’t sufficient in today’s world…. Bradford doesn’t need any help to remember, anyone who was there will never forget, and who cares whether Crawley town (my local team) applaud in the 56 minute or not. Just to be clear – I meant the biased tone in the guardian article – not Jason’s. Absolutely spot on. The rest of the world can take a running jump. Well said Jason. Best article on the subject for years. Thank you Jason, as ever you’ve captured what I and many others wanted to say but you’ve done it with far greater clarity and balance. I was, and still am, disappointed with Taylor’s article. Its particular interpretation of the city’s reaction as somehow not measuring up to his or any outsider’s standards of a suitable memorial is unfair and poorly judged, however much he may protest that there are no inaccuracies. On such a sensitive and raw part of our history, at a time when nobody truly knew how to cope or make sense of events, the mere statement of some facts (and not others) is brutal in all senses of the word. I think, therefore, it was poorly judged. I am deeply and forever proud of us Bradfordians for the way we mark this terrible event, and in the manner that we do, resisting the lure of the spectacle that the media seemingly demands of us. Next May, we will each remember that day in 1985 the way we always have done, together, with dignity, and with thoughts of the 56 and their loved ones very firmly but quietly in our minds. This has always brought us together, and I know that will endure. I was there that day and completely agree with everything you say Mark. Taylor’s arrogance when defending his article beggars belief; Jason’s article has much more balance and is more reflective of the wider views of the Bradford community. Like the poster above, like Steve Whitaker above, I am not a fan of the applause in the 56th minute, which to me seems arbitrary anyway, we get it at some games, and not at all at others, the flag jars as well I’m afraid. I get down to the memorial practically every year, and there is no more humbling sight than seeing grown men blinking back tears, I know I do it myself. But what is a joy to see amongst all this sadness is the number of children that I see there, they can’t have been at the disaster, but have obviously been brought along by their parents, who want them to remember, and more importantly, never forget. I too have always been very proud of the way Bradford has marked every anniversary, quietly, dignified, in a very `Bradford` way. Every year there are less and less memorials to the victims published in the T&A, and it always disappoints me, but its a very natural thing in actual fact. Some of those who posted memorials in the years after the fire will now be elderly, or even departed from this life themselves. Or maybe even time heals, as they say it does and there is no need to do it any more. BUT I would never condemn or criticise anybody. Its just the way it is, just as the way Bradford reacted to to the disaster in the months and years after it happened was also the way it was-then. Its also often overlooked but maybe should be highlighted now that the superb way that the Disaster Fund was administered was superbly handled by Roger Suddards who never got the gratitude he deserved for what must have been a difficult task. As far as I know there was never any recrimination to the way the disaster fund was shared. Unfortunately a bi-product of the increased publicity that the 30th anniversary is bound to attract, is that there will be lots more of these kind of stories appearing as we approach May 2015. There may even be journalists trying to upturn stones to see what lies beneath in the hope of a `juicy` new story relating to the fire disaster. As we know that these kind of people rarely let the facts get in the way of a good story, I feel that the days of `Bradford being the forgotten disaster` may be coming to an end. Thoughtful and balanced as ever, Jason. Being just a few months old, I wasn’t there that day and so find it difficult to imagine how I would have felt then and how I’d feel now. However, I do feel very uncomfortable that the fire appears to be used as a badge of honour amongst some supporters, the many of whom, like me, can’t have been there. In an age when we are bombarded with Premier League 24/7, Bradford City attracts little media spotlight. We don’t have million pound superstars, we don’t win trophies; but we have something that few other teams have…a tragedy. I believe that some of our supporters want to use it as our opportunity to gain our 15 minutes of fame, and that is something that deeply saddens me, not least because I think it undermines some of the fantastic yet understated work done in the 30 years since and cheapens what I consider has been dignified remembrance up until recently. I am also particularly uncomfortable with chanting in ‘remembrance’ of those who lost their lives. To be chanting about ‘Leeds scum’ one minute then ‘the 56’ the next leaves a sour taste and is surely not an appropriate way to remember those who lost their lives. Ultimately, I wasn’t there and thus my opinion will never be as relevant as someone who was, but I fear that our 15 minutes of fame will show us that fame isn’t all that it is cracked up to be. A really good article. Some really great points made and also in the comments. I was 12 at Valley Parade that day and like everyone else I have my story. But it’s fair to say that there seems to be increasing pressure to pay tribute ‘the right way’. I wasn’t offended at those kids at Crewe sang about the fire. In fact, I was more offended at the grown men who wanted to fight with them as they surrounded me and my 9 year old son and my father in law. In the same way don’t get offended by any article written by someone who doesn’t know. In fact the simple and honest way that our club chooses to commemorate is suitable with me. I don’t really believe that we can ‘commemorate’ the right way, as a commemoration by definition is always a sorry emotion. I don’t want to be led by the crowd as I’m pretty sure that the chants aren’t instigated by any survivor. There are even Facebook and twitter accounts in the name of the fire, so it’s fair to say that there doesn’t seem to be a true understanding of how other can be affected. I’d like to think that our solidarity is reflected in our passion for our team, and our compassion and care for each other and not referenced through chants, accusations or sensationalism. The comments above demonstrate that there are indeed different perspectives about the fire disaster and that there is no single narrative about it. For me the disappointing issue with the Guardian article was that it failed to recognise the need for balanced coverage of such a sensitive topic. Younger generations could thus take the wrong conclusions from the Guardian article about how Bradford people responded to the disaster. I remember full well 1985 and the aftermath, but not as reported in the Guardian. Before the anniversary and the narrative becomes hijacked by other journalists or simplified to Twitter hashtags it is vital that these comments and sentiments are not overlooked. In order to provide a record for posterity – and as a reference for the likely press attention in May – The City Gent is publishing a compilation of such reflections in the new year. All supporters are welcome to contribute personal thoughts about the disaster and its commemoration. Details will be provided in due course. When published it will be circulated to the national press so there is no excuse of not being aware of peoples’ feelings. Younger generations of BCAFC supporters also need to understand the background and the context of events so that they are capable of a balanced interpretation. How the 30th anniversary is reported will have a major bearing on shaping the disaster narrative. Everyone who experienced the disaster – as victims, survivors and family members alike – deserves a fair and balanced representation. If we cannot rely upon the national press to do this then frankly it needs to be done ourselves. Agree with both John and Mark Neale, however the sheer arrogance of the Guardian’s writer is appalling, it’s about him being right first and foremost, whilst tearing open old wounds and scars with no responsibility and no recognition that people criticising him also lost friends and family nearly 30 years ago. We all remember in different ways and yes that is based on age and personal memories, but I would never argue that one approach is right and another wrong. The editorial policy of CG was to work in what we considered to be the best interests of the club in its widest sense. We didn’t look to blame anyone as we did not consider it necessary and we were also mindful of the historical context. It was never the black and white situation that 30 years of hindsight might suggest. Besides there was a judicial review undertaking an examination of what had happened. I recall giving evidence to investigators but we didn’t have the arrogance to suggest we knew better than they. What I find hurtful about the Guardian article is the inference that thirty years ago we were a city of emotional retards who somehow forgot/ignored the fire. I do not want history to judge the 1985 generation by the sort of unbalanced coverage that appeared in the Guardian and which, no doubt, we can expect from tabloid coverage in May. The fire was a dreadful time, I was there and it hit me hard despite not losing anyone or being injured, I was just upset and numb all that summer so I can’t imagine how someone who lost a loved one would feel. However the targets of the Guardian article Stafford Heginbotham and Jack Tordoff did not just stare forward and do nothing. Stafford attended nearly every funeral and far from hiding was always available for media interviews which considering he was being blamed and grilled it was a job he had to do. At the same time he and Jack Tordoff had to rebuild the club from the disaster, the fire would have been an incredibly difficult time for them and I am sure it contributed to Staffords health problems and early death. I fear that the media circus instead of letting us remember the 30th anniversary in our own way which as others have said is moving and just right, will instead start a period of finger pointing and Witch hunt against the officials of the club at that time. just to add to John Dewhirst’s reply above, the inference from the Guardian article seems based solely on the views of the one individual with whom Taylor spoke and hence the lack of balance. One person yes, but one person whom he knows well and who lost four members of his family. Surely if we can all give our opinions or choose not to, then Martin Fletcher is entitled to do so too? Like most on here, on initial reading it seems one sided. But it’s bound to. It’s the questions from a man who for 30 years has had to deal with losing 4 family members, and rightly or wrongly, he feels the need for answers and wants to air his views (like we all are!). Who are we to tell him he’s wrong? For nearly 30 years, I like many posters on here have dealt with witnessing and being effected by the events of 11/05/85 in my own way. Let us not lose our dignity by denying others this opportunity. Daniel Taylor is writing his piece from the conversations he’s haf with Martin Fletcher. It’s not some tabloid hack raking up rubbish. If we persist in reacting angrily to views on the fire, then the hacks will think there is a hidden story, and descend upon us. Our dignified silence has always been our strength. Let’s not change. This is neither the moral maize nor the psychiatrist’s couch but for such a sensitive issue there needs to be balance and understanding of how people sought to deal with the disaster. There was/is no right answer and no-one had a guide book for how it should be done. History will judge events on what is recorded and no-one should expect the monopoly narrative however deserving or tragic their circumstances. This is not about being defensive or closing rank as opposed to seeking a balance of perspectives. It was not quite as black and white as hindsight might suggest. If the history of events is going to be analysed at the very least I’d like it to be recognisable to those of us who lived through it, notwithstanding different views or needs of how to interpret. Maybe that dignified silence will compromise a dignified judgment of that era. My biggest memory of the fire was someone shouting there is a fire who was stood next to me. I was 5 years old and used to go in the family stand at the time, Midland Road. I then remember a massive rush to get out of the ground and everyone standing on Midland Road looking at the stadium in dis-belief. A very shocking day and it still feels like a bad dream even though we all know it was real. Regarding the 56th minute clap I think its a good idea when done correctly as it was at Wembley.